Hanafuda cards, are beautifully illustrated Japanese playing cards that can be used to play a wide variety of games. 399 backers pledged $12,578 to help bring this project to life. Hey, Hi & Hello Kickstarter! 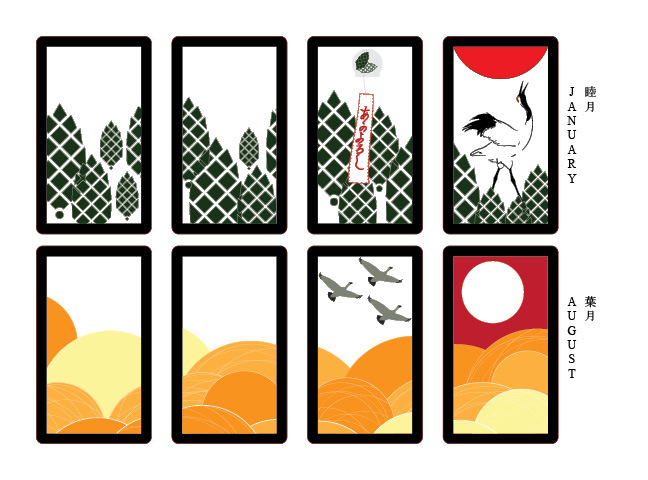 My name is Sarah Thomas and I'd like to introduce you to my Modern Hanafuda cards. Hanafuda cards are Japanese playing cards that can be used for a variety of games all around the world. Over the past couple months, I have been sketching my own modern version of the cards and I need your support to make the next steps possible. Look below for a bit of back story! The term Hanafuda literally translates from Japanese to "flower." This flower motif is important to the cards because each suit is represented using flowers in conjunction with other natural elements such as cranes, boars, and butterflies. What do your cards look like? All the art will be a modern take on the traditional set done by yours truly. The style of each card is reminiscent of paper cut-outs but will actually be accomplished through the use of Adobe Illustrator. Below are some examples for a few of my favorite months so far. Each card will measure 2.75 inches x 4.72 inches (70 mm x 120 mm). All cards will be printed on 305 gsm playing card stock, which is the same material high quality poker sets are printed on. The final package also comes with a custom designed tuck box to keep everything sorted and pristine when not in use. Please note that I'm still in the process of finishing the cards and if you become a backer, you can help make decisions on the final designs. For instance, the cards have a black border but based on user feedback, the final designs might have a red or white border. What are the suits for each month? What are some of the games you can play using Hanafuda art cards? Hanafuda cards are like any good poker deck and can be used to play many different games. Personally, I enjoy playing Koi Koi - a 2 player card matching game that is frequently played in Hawaii. If you are interested in other games you can play with Hanafuda cards, click here for rules and descriptions. There are many reasons why Kickstarter is cool and one of them is the way it treats projects. Like I said in my video, supporting my project isn't just a donation because you get really cool stuff in the process all while helping me achieve my dream. That is a really cool concept! However, if I am not funded, your money does not end up in a black hole because you and all the other backers are not charged unless the project is funded. This means there's less risk for everyone! On a more personal note, I think Kickstarter is a great way for designers like me to get my work exposed to the world. I feel it is a democratic way to help creative individuals launch themselves into the business of design. In fact, I believe so much in Kickstarter's mission that I am an avid backer. My hope is that you think my work is snazzy enough to support and ultimately raise enough mula to do a limited print run for my Hanafuda set that you can even pre-order. All right, I'm sold! What are the rewards? Take a look at the side bar there to see all the great rewards. Please do note that the posters are approximate sizes. I will know exact dimensions as soon as my prototypes come back from the printer, so stay tuned for updates! In the meantime, if you have any questions regarding the loot, feel free to contact me and I will happily answer your question(s). Thank you very much for your time and for your support! Good karma and warm fuzzies INSTANTLY! A warm thank you e-mail + one digital copy of a card (you choose the month). A warm thank you e-mail + one digital copy of a card (you choose the month) + one digital month poster (4 card spread and you choose the month). A warm thank you e-mail + one digital copy of a card (you choose the month) + one 11" x 14" printed month poster (4 card spread and you choose the month). A warm thank you e-mail + one digital copy of a card (you choose the month) + you have pre-ordered your very own printed Hanafuda set (including tuck box)! High five! A warm thank you e-mail + two digital copies of a card (yes you can choose different months) + you have pre-ordered 2 sets of Hanafuda cards! One for you and a friend! Double high five! A warm thank you e-mail + one digital copy of a card (you choose the month) + one 11" x 14" printed month poster (4 cards total and you choose the month) + you have pre-ordered 1 set of Hanafuda cards! Talk about massive loot! A warm thank you e-mail + two digital copies of a card (yes you can choose different months) + you have pre-ordered 2 sets of Hanafuda cards! One for you and a friend! All signed by moi. A warm thank you e-mail + one digital copy of a card (you choose the month) + one 11" x 14" printed month poster (4 cards total and you choose the month) + you have pre-ordered 1 set of Hanafuda cards! All signed by moi. A warm thank you e-mail + two digital copies of a card (yes you can choose different months) + one 12" x 18" printed month poster framed (4 card layout. 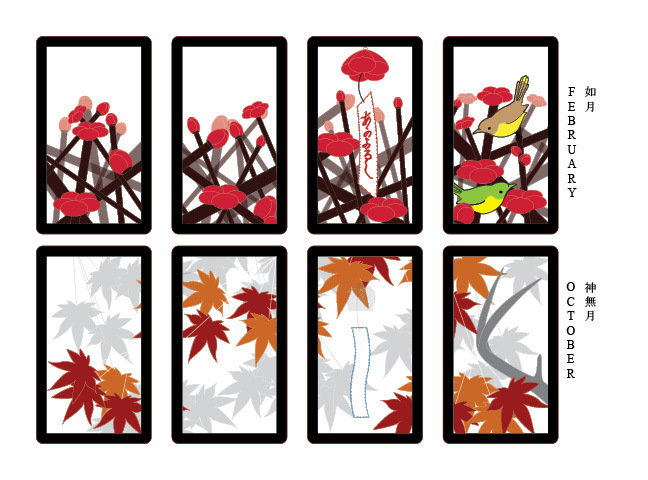 You choose the month and a choice of black or espresso frame) + you have pre-ordered 2 sets of Hanafuda cards! All signed by moi. Three fabulous backers will get a warm thank you e-mail + one digital copy of a card (you choose the month) + a digital poster of all the cards + 12, 11" x 14" printed month posters (signed) + 12 decks of the completed Hanafuda cards (also signed). One fabulous backer will get a warm thank you e-mail + one digital copy of a card (you choose the month) + a digital poster of all the cards grouped by month + 12, 11" x 14" printed month posters (signed) + 12 decks of the completed Hanafuda cards (also signed) + the express privilege to collaborate on the back design for all printed cards. Your name will also be listed on the Tuck box as a co-collaborator and mustache level sponsor for you are, oh! so fancy!